Now 33% More! Versus 45 Ct. 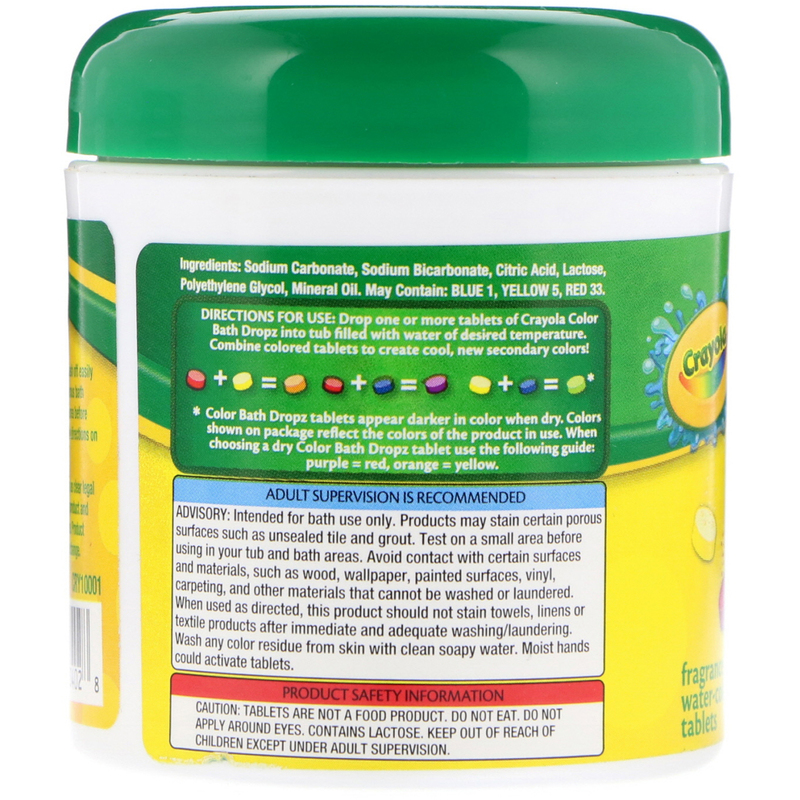 This product should wash off easily from most newer, nonporous bath surfaces. Test on small area before using product and follow directions. 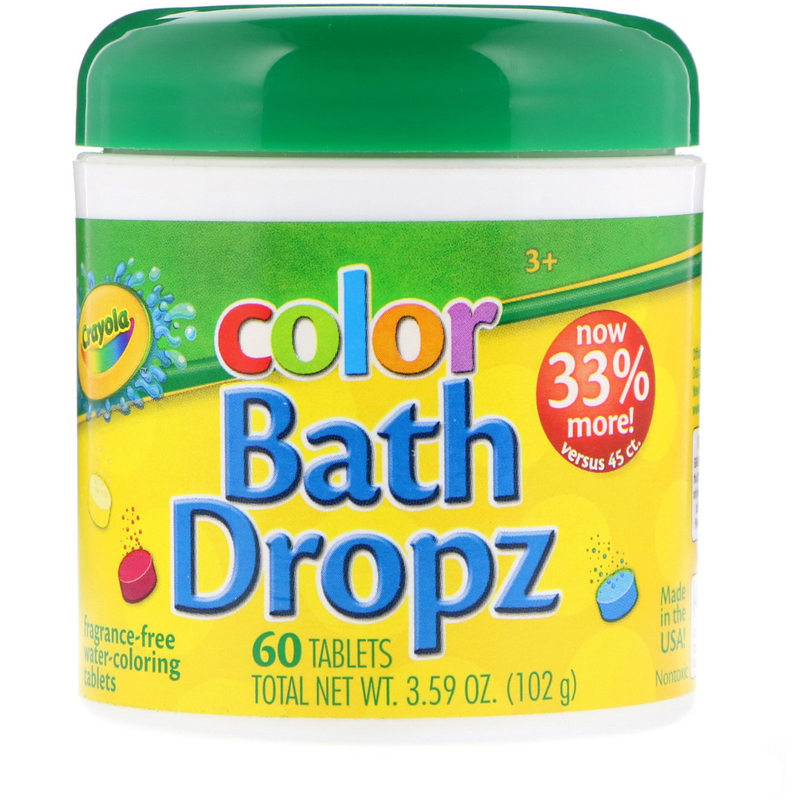 Color bath drops tablets appear darker in color when dry. 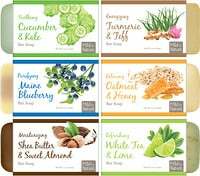 Colors shown in package reflect the colors of the product in use. When choosing a dry Color Bath Drops tablet use of the following guide: Purple = Red, Orange = Yellow. 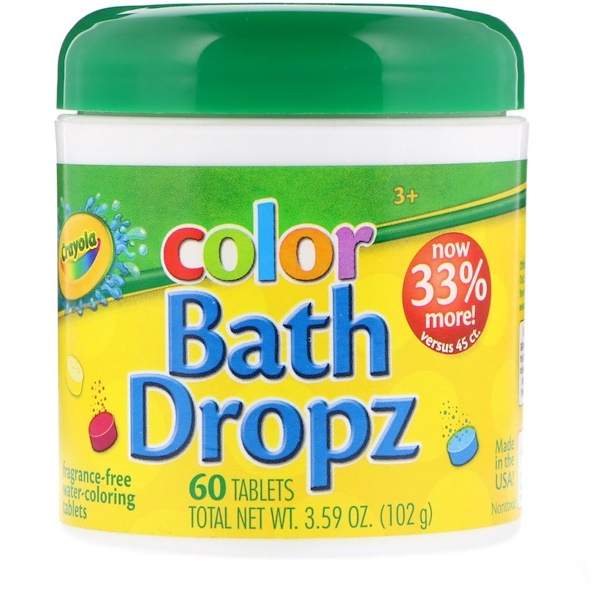 Drop one or more tablets of Crayola Color Bath Drops into tub filled with water of desired temperature. Combine colored tablets to create cool, new secondary colors! Sodium carbonate, sodium bicarbonate, citric acid, lactose, polyethylene glycol, mineral oil. May contain: Blue 1, yellow 5, red 33. Please keep this package as clear legal proof of the origin of the product and retain for future reference. Product specifications subject to change. Adult supervision recommended: Advisory: Intended for bath use only. Products may stain certain porous surfaces such as unsealed tile and grout. Test on a small area before using in your tub and bath areas. Avoid contact with certain surfaces and materials, such as wood, wallpaper, painted surfaces, vinyl, carpeting, and other materials that cannot be washed or laundered. When used as directed, this product should not stain towels, linens or textile products after immediate and adequate washing/laundering. Wash any color residue from skin with clean soapy water. Moist hands could activate bath bombs. Product safety information: Tablets are not a food product. Do not eat. Do not apply around eyes. Contains lactose. Keep out of reach of children except under adult supervision.